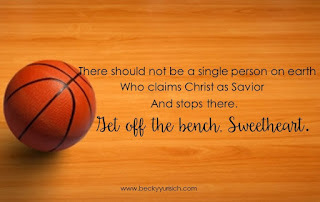 Becky Yurisich: Benchwarmers, Rise Up! It's Time to Get in the Game. Benchwarmers, Rise Up! It's Time to Get in the Game. The ball bounced off the rim, and I started to box out the girl behind me. I missed her, and we both went up for the rebound—bodies colliding, legs and elbows and hands all becoming one large mass as we battled for the ball just out of reach of our fingertips. That’s when I heard it. A popping sound, just as we came down with the ball. Our knees met as we made our descent, and her knee was the victor. I lay on the ground as my friend ran to our coach and said, “I heard it pop.” She had been standing at half court. My ACL was destroyed, and so was my seventeen year old heart. It was June 1999. The summer before my senior year. I was a varsity volleyball, basketball, and softball player. Whatever the game, I was in. I loved to compete. I loved a physical challenge. Most importantly though, I loved being a part of something bigger than I was. Something focused a common goal. My doctor told me my high school career was over. Not only would I miss volleyball, basketball was also out of the question. I spent the rest of the summer undergoing surgery and rehabbing my knee. It was painful and horribly emotional. The girl who had spent her entire life trying to outrun, outjump, and outplay everyone else, couldn’t even lift her leg off the table in physical therapy. Humbling doesn’t even begin to describe. Volleyball came and went. The new coach asked me to keep stats for the team, and I said yes, hoping it would fill some of the void. I cried every single game. I was no longer a player. No longer a contributor. I was a benchwarmer. 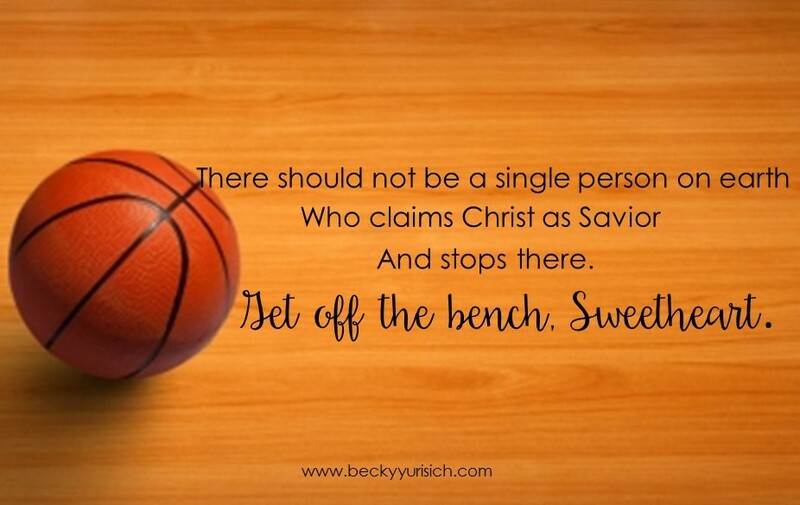 And I was not created for the bench. When basketball season arrived, my coach kept my spot on the team in hope that I would eventually be able to play (or because she was awesome—I never did clarify). The first day of practice, Coach told us to lie down on the ground and imagine what we wanted for our season. As tears leaked though my closed eyes, I imagined myself on the court with my team. Nothing else mattered. I just wanted to be a part of the game. About halfway into the season, my moment came. I can still see my dad’s face as I made my way onto the court. I can hear my friends and family screaming from the stands. It was almost exactly how I’d imagined it when I laid myself out on the gym floor a few weeks before. I was part of the game. And it was beautiful. The most ironic thing about this six month period of my life is that I haven’t played basketball since our season ended fifteen years ago. I wasn’t a college level athlete and as life went on, there wasn’t a reason to play. But God recently told me something through His Word and through a sermon at church last week: You are still not a benchwarmer. You are part of the game. As followers of Jesus, we are called to have faith first, but then we are called to act. Just as the body is dead without breath, so also faith is dead without works. James reminds us that when we put our faith in Christ, our actions will follow! There should not be a single person on earth who claims Christ as Savior and stops there. Get off the bench, Sweetheart. Action looks like believing in the resurrection of Jesus, that He is our Savior, and living out the gospel. Feeding and clothing the poor. Caring for widows, orphans, and anyone else who needs it. Demonstrating love to other Christians. Using a talent (cooking, being handy, and encouraging others are talents!) to help someone in need. Seeking out those who are different from us and building relationships with them. Read Matthew, Mark, Luke, and John. Learn what Jesus taught, and how He lived. Get to know Him! Then take all of that and apply it to your life. Reading the gospel will be the easiest part of this whole thing. 2. Look for ways you can live out the gospel. The most simple way to do this is to keep your eyes open for a need you can meet. Can you comfort someone? Are you able to sponsor a needy child? Can you contribute to your local food bank? Can you rock babies in your church nursery? 3. Meet the needs around you. The spectrum of ways to follow the gospel is immense! Once you begin to see the needs of the people around you, meet them. Caring for others is a good start. This may be as simple as washing a new mom’s dishes, or as complex as moving to Uganda and becoming a school teacher. God doesn’t care about the scale of your ministry, just as long as you have one! 4. Be willing to be inconvenienced. I’ve found that getting off the bench, even when I’d rather sit this quarter out, is worth it in the end. You see, much like my teams of yesteryear, we as Christ followers are working toward the same goal. Our actions, no matter how small, push us toward our reward. We just have to get in the game. Get off the bench. Run the race. Play your game. Not to make yourself known, but to magnify God. What can you do to get off the bench today? I’d love to read your comments! Great post friend! I love the analogy! in my Bible study class this past Sunday, we discussed practical ways we can do this. I love that I'm a part of a fellowship of believers who had examples of how they have ministered as well as ways others have blessed them. I definitely think blogging to encourage others is you in the game!